Free Vote Voluntary Recall Alliance (FVVRA) invite all Members of Parliament and all Candidates for Election to the Westminster Parliament to sign the FVVRA Pledge promising to represent the interests of their constituents, their region and their country above their party or any other interests. We call upon all Members of Parliament and candidates standing for election to the Westminster Parliament adopt and sign the FVVRA Pledge and to work for a Unified Cross-Party National Government that can address the urgent Social, Political, Financial and Climate crises which now faces our United Kingdom. Why are our MPs told how to vote by the party whips on most bills that go through the House of Commons? David Cameron MP gave us the answer: "[A Bill] gets sent to the House of Commons where it's debated without diligence--because automatic guillotines cut time short. It's passed without proper scrutiny--because standing committees for Public Bills are stuffed with puppets of the Government. And it's voted through without much of a whisper--because MPs have been whipped to follow the party line". The above quotation from a party leader whilst in opposition, shows that political parties are stern critics of the whipping system in parliament when in opposition, but then use exactly the same methods themselves when elected to government. 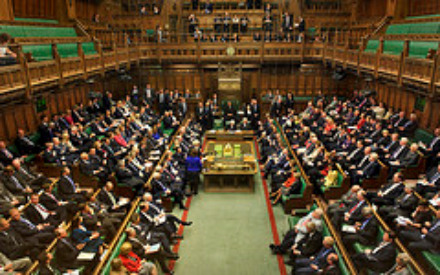 This Party Whips system which is used to enforce party decisions on our elected MPs, combined with the fact that the membership of some major parties has been reduced to very small numbers, has left our democracy locked into a situation where a very small elite of party activists have control over political parties, our government and our country. "We should be acting on behalf of our constituents and, using our "unbiased opinion" and mature judgment", scrutinising every piece of legislation that comes our way to hold the Government properly to account, regardless of party politics". "it is the people who control the Government, not the Government the people." As the quotations above corroborate, an MP who signs the FVVRA Pledge confirms in writing, their existing duty to the people of their constituency and the country. We only ask that they live up to these commitments and promises.